This morning I had to drive to work instead of taking the bus. On my way to work (approx. 25 miles) I saw four car accidents. Three of them involved more than two cars. The kicker is that all four were within three miles of each other. This got me thinking about a conversation I had this weekend with my brother. We both went on a four-day road trip to San Diego to visit family and friends. We had a discussion on the way back about the comparison between Socal drivers and Utah drivers. I can barely remember any accidents on the freeway during my childhood (I lived in San Diego until moving away to go to BYU). Sure, you’d have your occasional gnarly accident, but there was nowhere near the amount of fender benders you see in Utah, which from what I’ve seen make up around 90% of car accidents up here. I think it boils down to the assertiveness and aggressiveness of drivers. You can’t fix this problem by adding a lane to the freeway, increasing the speed limit, or anything else. It’s a state of mind. Utah drivers, from my experience, are mostly defensive drivers. They turn on their signal, look over their shoulder, start crossing over into another lane, and then jerk back to their originating lane when they see the car behind them not slam on the brakes to let them in. And then you get the looky-loos that create bottlenecks anytime there’s an accident. These are the type that drop down to 10 mph when they approach an accident so they can check it out. 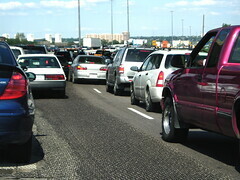 The domino effect then trickles through to everybody behind them, backing up traffic for miles. And then as a result, you get more fender benders (such as the four I saw today) with even more people slowing to see for themselves. Driving this weekend in San Diego was great. I miss it. Everybody is assertive, considerate, and knows how to drive on a freeway! I can’t wait to take the bus again tomorrow. Utah drivers are very sensitive, too. When I lived in New Jersey, people would honk at you if you didn’t drive like the rest of the crowd. Here in Utah, a honk is usually taken as the equivalent of a verbal attack. Driving in Jersey was a bit nerve-wracking for a few weeks, but I eventually got the hang of it, and ended up liking eastern-style driving much more than the “way” people drive out here. Connor, I disagree with the “use the signal” part, but everything else is spot on 100%. The realization I came to after about 6 months of Utah driving was that Utah drivers are more than super defensive, they are stewards. In everything else they do they have stewardships and look after them, this extends into driving. They believe that it is their job to enforce whatever speed limit they believe is safe and legal (thus slow people lingering in passing lane). Also, they don’t let you in if you need to change lanes because they are stewards over that space of road and don’t want to give that responsibilty up. They don’t need to signal, because they are simplying turning onto or changing lanes into a new stewardship, everybody else should allow them to take on their new responsibility and be understanding while they learn how to manage it (like a church calling). Also, take note of the terminology. It is NOT the fast lane, it is the PASSING LANE. A lot of Utah highway driving problems would be helped by simply changing that mindset. In Germany on the Autobahn that lane is SACRED. You enter it only when actually passing another vehicle and then get out as soon as safely possible. You never linger or travel in it unecessarily. You should never have to pass on the right, its is incredibly dangerous and should not be needed if we all used the passing lane appropriately. Another thought: I think the cruise control is another stewardship that is to be well tended on Utah highways. The breaking of the cruise control sped is the most heinous of sins, and should be avoided at all costs. I *hate* it when people swing over into the passing lane, in front of me, even when they’re going much slower than I am, only to keep their cruise control speed intact. As a fellow Californian, I must agree that driving in Southern California, even in Los Angeles, is a pleasure compared to driving in Utah County. I grew up in Utah but live in SoCal where I’ve been for the last 18 years and I feel safer driving here than I do on Utah roads. But I must add one observation of my own. Put California drivers on wet roads, especially snow, and you have a formula for disaster. Californians are total numbheads when it comes to driving on slippery surfaces. Last winter, I was driving home from work one evening and it had snowed, which is very uncommon around here. I counted 13 accidents along about 30 miles of freeway, four involving injuries, and none of them were multiple car accidents. That seems to be par for the course down here. Californians typically know two speeds–fast and none. I’m a typical California driver. I’ve learned to be aggressive, I let people cut in or merge without getting upset, I don’t use my turn signal much, and “stop signs” generally mean “slow down and look for other cars before proceeding.” I love California and plan to stay here forever.